If you play Kahoot in your classroom, (or want to play it) then this resource is for you! 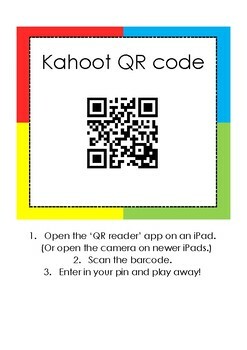 To set up each student with Kahoot, just have them scan the Qr code and go! Suggestion: I have a few laminated copies of this sitting in a designated spot in my classroom and pull them out whenever we play Kahoot! 3. Enter in your pin and play away!